Can you believe it is September already? This year seems to have flown by! 1. The challenge starts today and ends September 30 at midnight. 2. Create a layout, canvas, art journal page, or altered item, taking inspiration from the Inspiration Board: You can take inspiration from just one of the images, or several of them. This inspiration can be the quote, the colors, the overall feel of the board, something in one of the pictures on the board - your imagination is the only restriction you have on this! 3. Upload your layout into this album, and tell us in the description what you used from the board as your inspiration. The ladies on our Design Team will be providing you with their takes on the board as examples throughout the month. 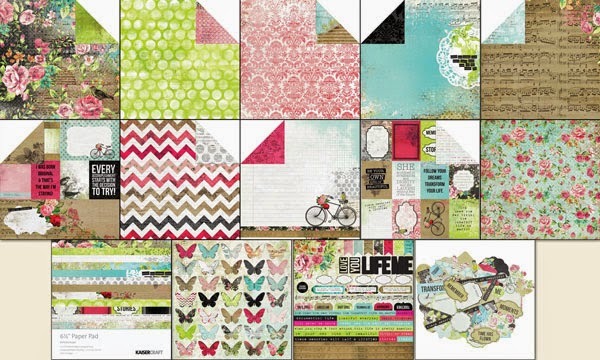 A winner will be chosen on or about October 1st, and will receive the following items from Kaisercraft's Kaleidoscope collection: 9 double sided patterned papers, 1 single sided varnish paper, a 6x6 paper pad, 2 different 12x12 Cardstock sticker sheets, and the Collectible Die Cuts. This prize is valued at over $33.00, and will be shipped to the winner free. And here's the prize we mentioned!